Zagat listed Drums N Flats "Must-Try Wings in Toronto" Blog.TO, INDIE88, Dine.to, Post City Magazines & Toronto.com "Best Wings in Toronto"
North Toronto is home to the greatest Rock N Roll Wings and Sports Bar on the Planet! Indulge in our full menu available till midnight, 7 days a week. Our menu features Fresh Ontario Chicken Wings, homemade burgers, beer battered fish n chips, forever cooked double dipped ribs, fresh salads, tacos and other great stuff. We are family friendly and a perfect spot to bring the whole team. With our state of the art audio and video system, outstanding sound, that is constantly pumping classic Rock n Roll & our 12 HD Flat Screens, plus a massive crystal clear 120" projection screen. DNF is the best place to watch sports in North Toronto, no contest. We have 2 outdoor patios & a beautiful bar and tables made of 200 year old reclaimed barn wood. This place Rocks! Buy DNF Gift Cerfitcates and Advance Tickets to All Live Music Shows online. Use the Gift Certificate Portal and if you can not make it to the show, you can still redeem the certificate(s) for delicious food & drink, they never expire! BEST LIVE MUSIC & SPORTS IN TOWN! Sunday Funday, Sports, Sports and More Sports!!! or We can deliver our outstanding food right to your front door! 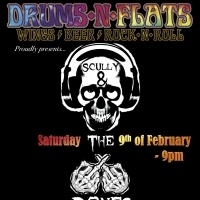 We're Talking Proud at Drums N Flats! Team Sponsorships Available on the SPOT! deals for teams of 6 or more, please ask your server for details.